Services - The Taylor Reach Group - Contact Center Consultants | The Taylor Reach Group Inc. Experience, in any discipline or endeavor, dramatically improves the likelihood of success. At Taylor Reach, we ensure that you, our client, benefits from our experience. Each Taylor Reach consultant has 20+ years of ‘hands-on’ Contact Center operational management experience. We are not learning at your expense, we already have the hard-won knowledge from hundreds of clients and thousands of Contact Centers. We view Contact Centers as a universal shared service, much as finance or human resources are services shared across an organization. Contact Centers are the hub of the Customer Experience (CX) and where more than 50% of all customer interactions take place. Vendor agnostic, Taylor Reach consultants ensure that you have the best guidance possible to help you meet your Call Center or Contact Center goals and deliver the desired CX. Whether you are looking at outsourcing, offshoring, insourcing, nearshoring or homesourcing, The Taylor Reach group can help you. Not only have we completed numerous consulting projects in all of these areas, but we have built and operated outsource organizations on two continents. With our unique and hands on experience as both consultants and outsourcers ..
After the cost of labor, technology is the largest cost component of a call center budget. Call centers can be very technologically dependent: ACD/platforms and switches, call recording, WFM, IVR, predictive dialing, chat, email management, knowledge management to name but a few. Running a call or contact center can be a challenge at the best of times. But this task can become significantly more difficult when there is a vacancy at the top of the call or contact center operation. Regardless of the cause of the vacancy: leave of absence, restructuring, center consolidation, or other organizational changes. The operational effectiveness and efficiency.. Your agents and employees are the single biggest asset you possess in delivering the desired Customer Experience, yet too often today this is a low paying, high turnover position. Too many call and contact centers have a ‘revolving door’ of agents. This high turnover is a constant drag on operational performance and customer satisfaction. There is always a better mousetrap, we just often need time to see and build it. Taylor Reach employs root cause analysis and lean approaches to ensure that the processes within and extending out from your call or contact center are optimized and function effectively, efficiently and logically. We can help you to redesign your processes to improve service quality..
Major issues for many centers is time, or lack of time required to complete the ‘call monitoring’ consistently, objectively and regularly. While all supervisors acknowledge that monitoring is important they are usually so pressed for time that listening is a “if I can” activity. How often has your team failed to meet the minimum number of monitors in a month? Contact centers deliver services to customers and prospects by telephone, email, and chat. It is essential that organizations have insight into the quality of those interactions. The internal perspective is often delivered through a quality listening team which reviews contacts and scores measuring based upon predetermined set of criteria. You can’t manage what you can’t or don’t measure. Developing and implementing a balanced set of metrics that are relevant and actually support business decision making is critical in any environment and this is also true of call centers. Should we be measuring FCR, NPS or CSAT and at what level and how? What about AHT and ASA is there a role for..
We have conducted hundreds of research projects since our founding and have assisted organizations to gain insights into the minds of the industry, their prospects and their customers. Our empirical approach leverages the hundreds of years of call center operations experience within the firm and integrates this with innovative and process thinking to design. 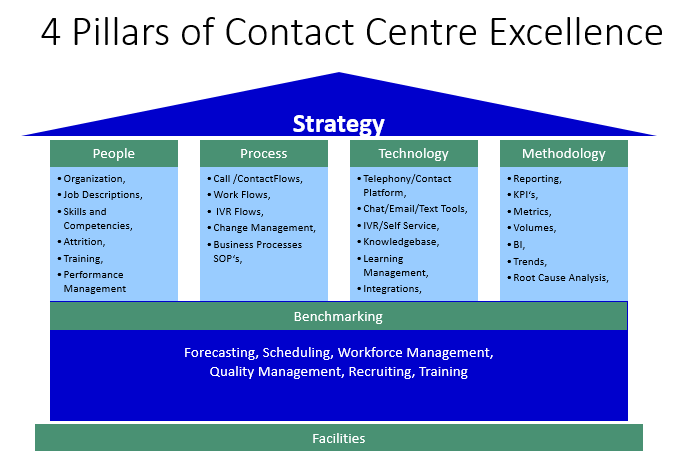 Many call centers today exist in locations, because that is simply where they were built. On the 3rd floor or across the campus, they are located where the organization had available space to house them. Increasingly however organizations are realizing that not all locations are created equal when it comes to operating a call center.